On 8 June, 1886, Lawrence W. Swem, a jeweler of West Liberty, Muscatine, Iowa, patented a keyboard adder (US patent 343506), somewhat similar to the earlier adder of Marshall Cram from 1877 and the later Centigrpah of Arthur Shattuck from 1891. Lawrence Swem was a holder of 6 more patents for various devices like: lamp extinguisher (patents US201570), hydraulic air pump (US556220), gas making apparatus (US595979), mold for castings (US981033), ring expanding press (US1154893) and hydrocarbon burner (US1216248). The numbers, entered by the keyboard, are transferred to the ratchet-wheel (B) by means of the rock-shaft (A). The wheel (B) is turning is turning freely or loosely thereon, and is provided with a specific number of teeth, ordinarily one hundred. This wheel can be rotated only in one direction, which is secured by a radial arm (C), a pawl-arm (D), retaining-pawl (F), and a spring (B'). 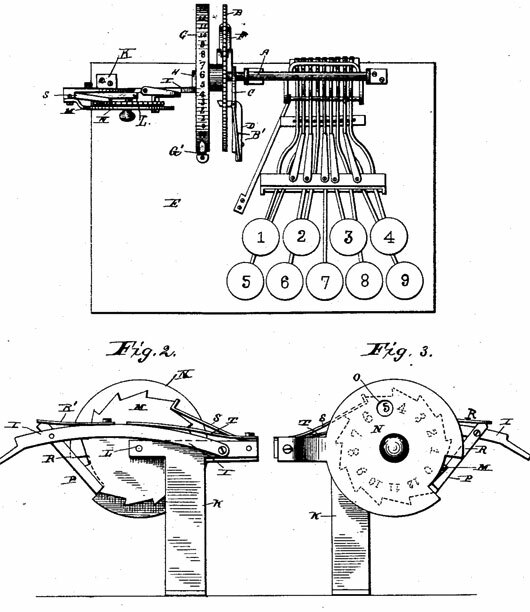 The calculating machine of Lawrence W. Swem (the patent drawing). Secured to the ratchet-wheel (B), so as to turn with it, is a disk (G), having a series of numbers (from 1 to 99) on its periphery. The number entered on the disk (G) can be ascertained by means of a suitable indicator (G'). The carry mechanism is implemented by means of a cam (H), mounted on the one side of the disk (G), on which rests one end of the an arm (I), the other being pivotally supported on a post (K), erected on the base (E). The post (K) has on top an extension (L), which supports a ratchet-wheel (M), with a specific number of teeth, say 14, and a plate (N), with an orifice (O), through which may successively be seen numbers on the said ratchet-wheel (M), corresponding in position to the teeth thereon. When the disk (G) has revolved once, the cam (H) will raise the arm (I) till it has reached the apex of the said cam will carry the pawl (R) from one tooth of the wheel (M) to another. Thus it is evident that if there are 99 numbers on the disk (G) and 14 on the wheel (M), any number from 1 to 1500 may be indicated, and addition of amounts till the said sum is reached easily and rapidly accomplished without mental labor. Who was the inventor Lawrence Swem? Lawrence Wilson Swem was born in Iowa in 1856, a son of Ezra B. Swem (1815-1871) and Phoebe (Phebe) H. Swem (nee Gregg) (1819-1887). Lawrence had two sisters—Amanda Jane (1842-1921) and Mary (1848-1869), and two brothers—William Carroll (1860-1931) and James Madson. Lawrence Swem married on 28 June, 1877, to Elva Ora Swem (nee McFadden) (1859-1922). They had 2 children: Roy J. Swem (1878-1934) and Gay L. Swem Wilbur (1881-1959). Lawrence Wilson Swem spend most of his life in West Liberty, a small town in Muscatine County, Iowa, United States, working as a jeweller and mechanic. Lawrence Wilson Swem died on 28 September, 1917, and was buried in Oakridge cemetery, West Liberty.